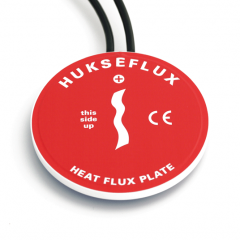 HFP01SC self-calibrating heat flux sensorTMis a heat flux sensor for use in the soil. It offers the best available accuracy and quality assurance of the measurement. The on-line self-test verifies the stable performance and good thermal contact of sensors that are buried and cannot be visually inspected and taken to the laboratory for recalibration. The self-test also includes self-calibration which compensates for measurement errors caused by the thermal conductivity of the surrounding soil (which varies with soil moisture content), for sensor non-stability and for temperature dependence. HFP01SC measures soil heat flux in W/m2. It is used when the highest level of quality assurance and a high measurement accuracy are required. In essence, HFP01SC is a combination of a heat flux sensor and a film heater. The heat flux sensor output is a voltage signal that is proportional heat flux through the sensor. At a regular interval the film heater is activated to perform a self-test (see figure 4). The self-test results in a verification of sensor contact to the soil and in a new sensitivity that is valid for the circumstances at that moment. The latter is called self-calibration. Implicitly also cable connection, data acquisition and data processing are tested. The result is a much improved accuracy & quality assurance of the measurement relative to measurements with conventional sensors such as model HFP01. Soil heat flux sensors are preferably left in the soil for as long as possible, so that the soil properties become representative of the local conditions. Using self-testing, the user no longer needs to take sensors to the laboratory to verify their stable performance. A typical measurement location is equipped with 2 or more sensors for good spatial averaging. Click on drawing in Gallery for HFP01SC dimensions: (1) heater, (2) heat flux sensor body, (3) cable. All dimensions are in mm.